Guglielmo Marconi is popularly known as “the inventor of radio,” a mischaracterization that critics and supporters of his many rivals are quick to seize upon. Marconi was actually the first person to use radio waves to communicate. His first patent was for “Improvements in Transmitting Electrical Impulses and Signals and in Apparatus Therefor,” and he considered what he was doing to be a form of wireless telegraphy. But Marconi was indeed the first truly global figure in modern, mass communication. What came to be known as radio would have been impossible without the groundwork laid by Marconi. As soon as he discovered how to send signals across a room in his parents’ attic in 1895, Marconi was convinced that he would eventually be able to connect any two points on earth by wireless. Conventional physics scoffed at the idea but Marconi was right. 1. Marconi was half-Italian and half-Irish. His father was a landed gentleman from Bologna, where Marconi was born and grew up, but his mother was a member of the Jameson Whiskey family. Annie Jameson’s family business connections in London were crucial to the launch of Marconi’s global company in 1897, when he was 23. 2. Marconi had no formal higher education. He did poorly in school as a child and his parents hired private teachers to tutor him in chemistry, math, and physics. His most important mentor was a high school physics teacher in Livorno by the name of Vincenzo Rosa. He was an avid, self-guided reader of popular scientific journals, where he learned of the discovery of radio waves by the German physicist Heinrich Hertz. 3. Marconi was twice engaged to American feminists: Josephine B. Holman, a graduate of the Indianapolis Classical School for Girls as well as Bryn Mawr, and Inez Milholland, a Greenwich Village social activist who famously led a 1913 suffragist parade riding a white horse. Marconi’s two wives were more conventional women but Marconi was forever becoming romantically involved with artists, film stars, opera singers, and journalists. 4. Marconi was the first inventor-entrepreneur to win a Nobel Prize, for Physics, in 1909 (he shared the prize with German physicist Ferdinand Braun). The Nobel Committee had never before awarded the prize for a practical application rather than theoretical accomplishments. In 1909, it considered giving the prize to the Wright brothers, but decided on Marconi because of public concern about the safety of airplanes. 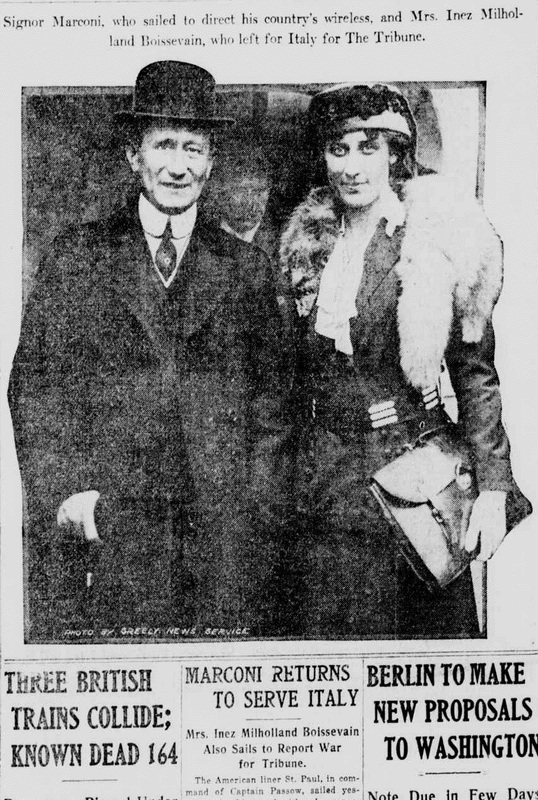 Marconi and Inez Milholland, Tribune front page, 23 May 1915 (New-York tribune. (New York [N.Y.]), 23 May 1915. Chronicling America: Historic American Newspapers). Public domain via the Library of Congress. 5. No one would have survived the Titanic disaster had it not been equipped with a Marconi transmitter. Thanks to wireless, the nearby Carpathia arrived at the scene in time to save 705 passengers and crew members. Marconi, who happened to be in New York at the time, was one of the first witnesses called by the US Senate Inquiry into the disaster. He advocated that ships at sea be obliged to operate their wireless equipment round the clock, and this was endorsed by the committee. 6. Marconi was the first person to speak publicly about what we now call cellphones, tasers, and radar. He was forever being egged on by the press to make outlandish predictions, but he refused to forecast anything he was unable to demonstrate empirically. “Spiritualists”, such as the writer A. Conan Doyle, considered wireless communication a form of mental telepathy but Marconi insisted that it was rooted in the natural universe. 7. Marconi was an Italian delegate to the Paris Peace Conference, after the First World War. He met privately with US President Woodrow Wilson in Paris, but was unable to convince Wilson to support Italian postwar claims to parts of the dismantled Austro-Hungarian Empire. The rejection of Italy’s claims in Paris eventually led Marconi (and many others) to support Benito Mussolini’s fascist movement which aimed to restore Italian grandeur. 8. Marconi’s company was involved in the founding of both NBC and the BBC. In England, the Marconi company was the lead member of a consortium of electrical equipment manufacturers that formed the British Broadcasting Company; in the US, the Radio Corporation of America, parent of NBC, was created by the forced takeover of Marconi’s US assets in 1919. 9. Marconi built the world’s first international shortwave broadcast station, Vatican Radio, which went on the air in 1931 (a year before the BBC World Service). A street in the Vatican Gardens is named after Marconi, a rare distinction for someone with no direct connection to the Church. 10. For nearly twenty years, Marconi’s home was a 220-foot yacht that he christened the Elettra (or “spark”). Marconi purchased the boat, which had been built for an Austrian prince, from the British government after the First World War. He equipped it with a wireless research lab and a staff of 35, and also named his youngest daughter Elettra. 11. Marconi was a member of Mussolini’s Grand Council of Fascism. He joined the National Fascist Party in 1923 and served Mussolini as president of Italy’s National Research Council, and the Royal Academy of Italy. 12. Contrary to a persistent urban legend (started by an erroneous report in the New York Times), Mussolini was neither the best man nor a witness at Marconi’s second wedding in 1927. Marconi had invited Mussolini to attend, but he replied that he was too busy and sent a telegram of congratulations. 13. When Marconi died, radio stations all over the world went silent in his honour. The Vatican Osservatore Romano reported that he had died “a Christian death,” but in fact Marconi declined to receive the last rites of the Church. 14. 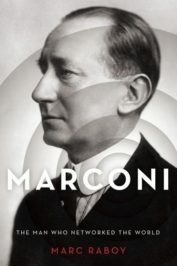 Marconi was said to be privately disturbed by Mussolini’s alliance with Hitler, but as late as April 1936 he publicly called for closer ties between Italy and Nazi Germany. The German führer sent the largest wreath to Marconi’s funeral. 15. In his radio address celebrating the fall of Rome in June 1944, Franklin Delano Roosevelt called Marconi one of the four “great sons of the Italian people,” along with Galileo, Michelangelo, and Dante. Featured image credit: Marconi (second from left) hosting Nazi Minister Hans Frank (fourth from left) at the Italian Academy, Villa Farnesina, Rome, 4 April 1936 (Archivio storico Istituto Luce). Image used with permission. Marc Raboy is Professor and Beaverbrook Chair in Ethics, Media and Communications at McGill University. He is the author of Marconi: The Man Who Networked the World. Marconi actually faked his own death and went to South America to start a civilian flying saucer program, after learning about the flying saucers being made by the Nazis.